This red brick school was built in 1902. 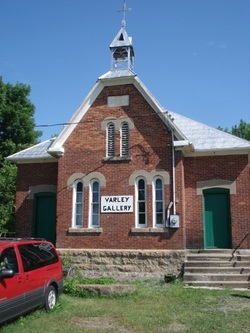 The old Crosby Public School is now the site of Grace Varley's art gallery located near Crosby, Ontario. Inside are original watercolors and oils. Notice the separate entrances for boys and girls, the tin roof, lovely bell tower and cross. The Red Brick School is a one-storey, one-room brick structure located on Halladay Street in the Village of Elgin, Township of Rideau Lakes. By the 1850s, the village of Elgin was thriving with a growing population and a number of commercial businesses well underway. The need for a local school led to the construction of the Red Brick School in 1887. Built to the specifications as laid out by the Department of Education for a “perfect” school during the late nineteenth century, the Red Brick School stands as one of the oldest remaining school houses in the area, attended for nearly 80 years by village children. The Red Brick School is representative of public education reform in the Province of Ontario. In the 1880s the Department of Education surveyed rural schools and found them to be cramped, poorly lit, and lacking in ventilation and sanitary facilities. In 1886, a set of guidelines for the construction of schools was released by the Department of Education. Recommendations from that report addressed those issues along with greater attention to architectural style and landscaping to better reflect the significance of education in the community. In the summer of 1887, a newspaper announced that Fred Tabor of Morton was awarded the tender to construct this “fine school house” which functioned as such from 1887 until 1964. The Elgin Public School is a particularly fine example of rare, rural, architect-designed, educational structure, the third school to be constructed within the village, and representative of historic, social, and educational development in rural community life. Contemporary multiple-room schools in urban areas were often designed by architects but, very few one and two room schools in Ontario's townships and hamlets were architect-designed. The Red Brick School is an excellent example of architecture that illustrates the evolutionary development of education in rural one and two room schools during the late nineteenth century. Opened in 1887, this charming two-room brick school, built by local contractor, Fred Taber, replaced a smaller wood-frame building. School Section No. 5 in South Crosby is a very early example of the late 19th century campaign to improve Ontario's system of public education through the construction of better buildings. Committed to fostering social, moral and economic progress through formal classroom instruction, the province's Department of Education encouraged late Victorian era school boards to erect larger, more sophisticated schools. Although local officials were often reluctant to raise the taxes necessary to finanace such expensive departmental initiatives, some forward-looking communities, such as Eligin, sponsored the construction of architecturally elaborate schools, which showcased their local pride and commitment to progress though education. S.S. No. 5 South Crosby is of red brick on a stone foundation and appears to be two storeys in height but, in reality is two spacious rooms with very high ceilings. Facing the road, the school features three very large multi-paned windows with a gable over each. The central gable is ornately curved with a stone insert while the flanking gables are more traditionally triangular. Each window is ornately crowned with a slightly curved pattern of yellow bricks, which are repeated in the quoining. At one time there was an onion shaped, domed, bell tower which unfortunately has disappeared. The Red Brick School served the children of Elgin and area from 1887 to 1964. It was designated a Heritage Building in 1986. Recent research suggests that this may have been the first rural school in Ontario constructed according to the guidelines published by the Department of Education in 1886.